As patch 1.0.7 continues to be worked on, questions are popping up about just what changes and fixes will be part of the patch. The Known Issues List has many issues, including one that could change weapon damage if it was "fixed". That has been addressed recently by blue posts, along with long-standing bugs for achievements. Update: See the Patch 1.0.7 Guide for all the patch 1.0.7 info! An ongoing bug today, relates to public chat channels in Diablo III not showing up properly. Apparently this is also related to an issue with the European Diablo III client, where some English clients were showing the German version of the EULA. A technical support thread has been following the issue. MinMaxDam Affix is calculating the damage bonus on weapon incorrectly. There has been much discussion about this, including a lengthy Reddit thread. The question is about so-called "black weapons" that do not have an elemental damage property; just +min and +max damage are listed. 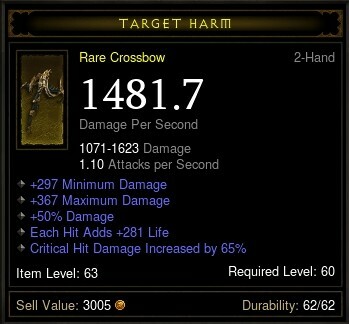 One example of that is the crossbow pictured above. There was much concern that a fix to this would end up reducing the damage on those type of weapons. A blue post removed concerns about that changing in this patch, and made it clear that if this is ever fixed in the future, it would not change weapons that are already in the game. We do our best to ensure that we alert the community in advance of game changes (just like we did for the Legendary Item Improvements), and in this particular case, I wanted to jump in to reassure everyone that “black weapons” (i.e. weapons with the MinMaxDamage Affix) are not going to be nerfed in patch 1.0.7, and we have no plans going forward to nerf them. Known Issues are just that, bugs that we know about. They are NOT necessarily bugs that are going to be fixed. The MinMaxDamage bug has been a bug known to us since July of last year, however, we did not want to fix a bug that would effectively nerf a large number of existing weapons. That’s why we did not fix the bug in any previous patch that we've released since the bug was found, nor are we fixing it in patch 1.0.7. Currently, the plan is that at such a time that we address the bug, the bug fix will only apply to newly created items, so as to not adversely affect existing items. I'm still curious though, in the hypothetical scenario that this bug is fixed, will it be a buff or a nerf? I think the theorycrafting folk would really appreciate clarification on what the expected proper behavior of the minmaxdam affix is. If and when we consider making adjustments to the MinMaxDamage affix (whether it be a bug fix or some other change), we’ll be sure to let you know in advance or otherwise provide as much warning as possible. We haven’t decided on anything yet, though, or really even discussed much in the way of possible changes. So, while I definitely admire theorycrafting and appreciate why you’re posting the hypothetical, there’s not a lot more clarity to provide other than what I’ve already given. It’d just be speculation at that point, and that’s not a very good role for me or any Community Manager to really serve. It is possible to not be able to receive the “Bashanishu” achievement if you hit Bashiok using a Basic Attack (not a skill). This bug has existed for many months, but it looks like it should finally be fixed in patch 1.0.7, if all goes well. This is a known bug I'm afraid. We don't have a fix ETA, but we can tell you that it's almost certainly going to require a content patch. Let me check for you CorneliousJD. OK, it has been slated for 1.0.7 but as the patch content has not yet been finalised, the developers can't guarantee that it will be in there at launch. That brings up a good point about a patch like 1.0.7. There are many changes and fixes that are being tested at any given time, and while the developers try to get in as many fixes as they can for a new patch, some of them may slip to a later one. 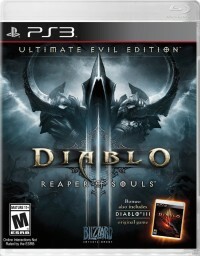 Two other threads recently dealt with changes that some players would like to see made, to Diablo III. First, on the European forums the Community Manager Vaneras posted in a lengthy The "Complete" Diablo Fix-list thread. I am unfortunately not able to make comments on each individual point though, but as we have seen many of these points (or similar ones at least) posted before, I can say that we are taking them to heart... It is important that you guys are aware that big changes and improvements takes time, so we will have to prioritise things on what we can be implemented faster via patches and what will have to be pushed for later implementation via expansions. We wanted a game based on D2 with an expanding gameplay and additional (not less!) mechanics and ideas. We stated several times right from the start that Diablo III is its own game, that we never intended for it to be an HD version of Diablo II. We acknowledge that Diablo III needs to be a better game, and we intend to make it so, but you should never expect it to be turned into Diablo II. In my personal opinion, a great sequel pays homage to its predecessors and at the same moves forward with new content. It is fairly normal though, that sequels replace features from predecessors with new features, and I can of course agree that it is an issue if those new features fall short of what is intended. I think you are overreacting a little bit here to be honest, at least it feels like you are jumping to conclusions. First of all, I acknowledged that Diablo III needs to be a better game, which corresponds with previous statements we have said about the game not being where it needs to be in regards to a long-term sustainable end-game. Nowhere did I acknowledge that the game is incomplete and nowhere did I state that you must pay for fixes and improvements! We still feel Diablo III is a good game, and despite the shaky release, we still see that there are many people out there who enjoy and play the game. Second of all, I wasn't making any announcements about any number of patches and expansions. I was speaking in general terms when I talked about how future changes and improvements must be prioritised - Some things take longer than others, typically because they are more complex. And since complex things can take a lot of development time, said things at times require to be scheduled so they correspond with the release of an expansion, whereas the things that take less development time can be implemented faster via patches. There have been plenty of times where we have released changes and improvements to our games alongside expansions - changes and improvements that were made available to everyone for free - where people only have to pay if they want access to for an example new zones and more levels. The World of Warcraft expansions are a great example of this approach. 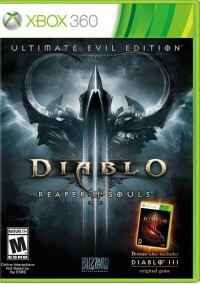 It would be an ok game if it was called anything else than Diablo.. 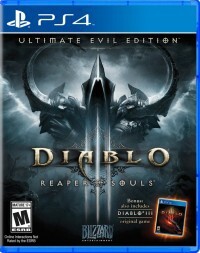 This is nowhere near the standards of the diablo franchise srry, you can tell us 150x more you find it a good game that won't make us change our minds you know..
As I said previously, we acknowledge that Diablo III needs to be a better game. 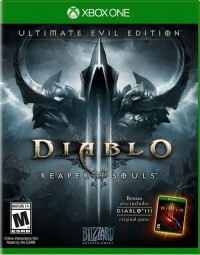 That being said, we do not agree that Diablo III is a bad game. I know that Diablo III is not what everyone wanted it to be, that there are some people who are so disappointed that they are only able to voice their frustrations through hyperbole, and for those people there is little I can do or say to help ease their minds. All I can say is that we are trying to make Diablo III the best game that it can be, but some things take more times to improve than others. I totally understand if this is hard to accept for some people. In another thread Grimiku gave a reply to a thoughtful discussion, regarding the idea of "good equipment" being too easy to obtain. This post is a good read with a lot of great feedback and I appreciate you putting it together. Thanks! While there are other points in the original post, I wanted to briefly talk about items since it’s the big one. We know that (for many players) it’s much more rewarding to gear up from items that you find while playing normally than it is to necessarily go through Auction House, and we’re working to make improvements in that area. There are a lot of ways we could attempt to reach that goal, and choosing the best one(s) to go with is not always a fast process. I want to encourage you all to continue to post your thoughts on the subject and I promise we will keep reading and relaying them. The addition of the many pieces of crafted Rare Account-Bound equipment is clearly a way to deal with some of this issue. As the process continues for patch 1.0.7, we'll see more issues narrowed down and finalized, before it is released to the live servers.